I finally finished. 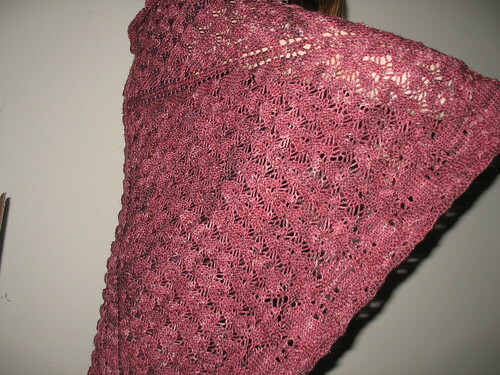 I have to say I really love this shawl. I had intended to make it a bit smaller but misunderstood that pattern directions (by a lot) and thought I was finishing early, but no. It was probably just as well, since thinking I had much further to go, probably spurred me past my normal malaise. In the end I love it. I found these garden kneeling pads in the dollar section at Target and they worked great for blocking. They are rubber foam so fine with being wet and jabbed with pins. Great find. The pattern kind goes like this \ then this / then this \ again. The second \ moves over a bit creating a staggered effect. The pattern says to go to 19 tiles I was counting one whole succession as a tile so thought I had only made it to ten. However I think, what it meant was you have 19 bobbles per side - which I do. I did notice I didn't have as much yarn as one might think if I still had all this more to go. 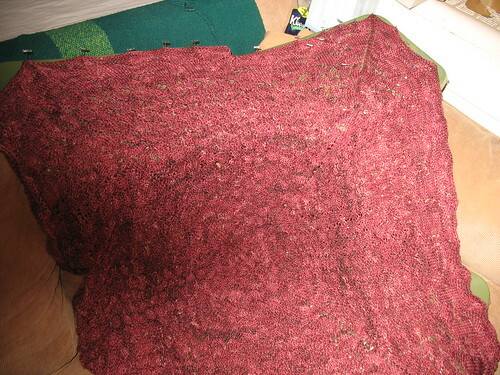 And I misplaced a partial skein so freaked out and bound off three quarters of the way through the lotus edging. I am happy with the final look, so it's all fine. All in all, it's a great pattern, but I would suggest this is better suited for someone's second or third lace shawl, rather than their first. Or something they do in a class. Looks as if you also were at the O Street workshop. Your completed shawl looks great. Did you have any difficulty with the count for the lotus edging? 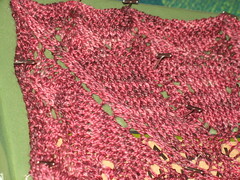 I've ripped and knit so many times trying to do the edge I think I've made two shawls instead of one. Yeah, there is an issue with the edging - the stitch counts don't really match. I had sort of steamed right through it, thinking it was a factor of starting the edging too soon.